In Delirium by Lauren Oliver, Love is considered a disease. Characters get a vaccine for it. In Marissa Meyer's Renegades, the collapse of society has left only a small group of humans with extraordinary abilities. They work to establish justice and peace in their new world. Scott Westerfeld's Uglies is on everyone's favorite list. The plot goes like this: Everyone wants to be pretty. And their 16th birthday, they can be surgically altered to be a "pretty." During the surgery, however, lesions are put on their brains. These can cause illness, or hinder your thinking. If characters get an important enough job later on, they get those lesions removed. The teens explaining these books are sitting around a table at the public library in the idyllic west Michigan town. Tonight the book club is meeting to talk about House of The Scorpion by Nancy Farmer — the gathering is part of the library's young adult programming. After a brief plot description (there's a drug lord, clones and, of course, a rebellion against the status quo), Taylor Gort, 17, starts things off: "It's a question of how many ethics rules are you willing to break," she says, referring to the book's main character, El Patrón. Amanda Heidema, the librarian leading the discussion, nods her head, "I mean, is making a clone ethical?" There are a few beats of silence before Will Anderson shakes his head: "No, I don't think it is." The conversation goes on for nearly an hour — flowing from clones, to whether or not manipulation is evil, to how screwed up adults are (can you believe they think this book is dystopian? It's not.). That last one — how messed up grownups are — it's a hallmark of dystopia, especially in the young adult genre. When I ask the group why they think these types of books are so popular with teens, they tell me it has a lot to do with relatability. "There tends to be a common teen-angst thing, like: 'Oh the whole world is against me, the whole world is so screwed up,' " Will explains. Teenagers are cynical, adds Aaron Yost, 16. And they should be: "To be fair, they were born into a world that their parents kind of really messed up." Everyone here agrees: The plots in dystopia feel super familiar. That's kind of what makes the books scary — and really good. 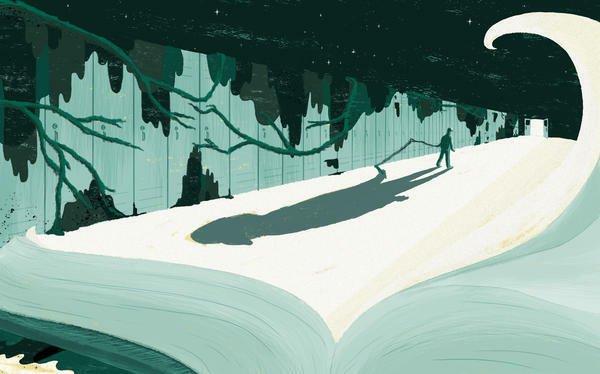 Think of it like this: Teen readers themselves are characters in a strange land. Rules don't make sense. School doesn't always make sense. And they don't have a ton of power. "Their parents impose curfews, and no one lets them drive unless they are ready or not," says Jon Ostenson, who studies young adult dystopian literature at Brigham Young University in Utah. He published a paper on the subject in 2013, for which he spent months reading YA dystopia. "I had to take a break for quite a while — unfortunately there's not a lot of utopian fiction to balance that out." In dystopia, he says, "Teenagers see echoes of a world that they know." These books don't always have a happy ending, and they're all about choices and consequences. "The hallmark of moving from childhood to adulthood is that you start to recognize that things aren't black and white," says Ostenson "and there's a whole bunch of ethical grey area out there." "Their brains are very responsive to emotionally arousing stimuli," he explains. During this time, there are so many new emotions and they are much stronger than those kids experienced when they were younger. "When teenagers feel sad, what they often do it put themselves in situations where they feel even sadder," Steinberg says. They listen to sad music — think emo! — they watch melodramatic TV shows. So dystopian novels fit right in, they have all that sadness plus big, emotional ideas: justice, fairness, loyalty and mortality. This time in a kid's life is often defined by acting out, but, Steinberg says, that's a misguided interpretation of what's happening. "It isn't so much rebellion, but it is questioning." As the brain develops, so does executive functioning. Teens start to understand argument, logical reasoning and hypotheticals. "Kids are going through a stage in development when they are trying on different identities," he says, "flexing a muscle that they now have that wasn't very strong before." The fact that these books offer a safety net, a place where kids can "flirt with those questions without getting into trouble," that's reason enough to keep teachers and parents buying them off the shelf. Here's a sample of some of the titles on the New York Times best-sellers list for young adults - "The Book of Dust," "Renegades," "War Cross." If you can't tell from the names, these books are all dystopian fiction. Elissa Nadworny of the NPR Ed team wanted to know why teenagers love these stories so much, so she went straight to the source. ELISSA NADWORNY, BYLINE: The plots of young adult dystopia can be pretty amazing. UNIDENTIFIED BOY #1: They live underground somewhere, except they don't know they live underground. UNIDENTIFIED GIRL #1: You get a vaccine for delirium which prevents you from falling in love. UNIDENTIFIED BOY #1: Somehow, a bunch of various figures from history got put into the present day. UNIDENTIFIED GIRL #2: During the surgery to make you pretty, there are these lesions in your brain. UNIDENTIFIED BOY #2: And once you do get sponsored by a company, you become part of this, like, elite clique of people. That one was really scary because it seemed like something that could actually happen. NADWORNY: Those are teens from Holland, Mich., talking about the recent books they've read. I'm at their book club, which meets about once a month at the public library. Today, they're discussing "The House Of The Scorpion" by Nancy Farmer. There's a drug lord, clones working in a field and, of course, a rebellion against the status quo. Seventeen-year-old Taylor Gort starts things off. TAYLOR GORT: It's a question of how many moral ethic rules are you willing to break? NADWORNY: Amanda Heidema, the librarian leading the discussion group, jumps in. AMANDA HEIDEMA: Yeah. Is making a clone ethical? Yeah. NADWORNY: Will Anderson shakes his head. WILL ANDERSON: No, I don't think it is. I don't think so. ANDERSON: Playing God. And I don't like that. NADWORNY: ...To how screwed up adults are. In fact, screwed up adults actually play a major role in a lot of young adult dystopian fiction. ANDERSON: It tends to be a common, like, teen angst thing to be like, oh, the whole world's against me. Everything's so screwed up. NADWORNY: Teenagers are cynical, adds Aaron Yost, 16. And they should be. AARON YOST: To be fair, they were kind of born into a world that's - their parents kind of really messed up. NADWORNY: Everyone here agrees dystopia is super relatable. That's kind of what makes it scary and really good. Think of it like this. Teen readers themselves are characters in a strange land. Rules don't make sense. School doesn't even make sense. JON OSTENSON: Their parents impose curfews, and nobody lets them drive until they're 16 whether they're ready or not. NADWORNY: Jon Ostenson studies young adult dystopian literature at Brigham Young University in Utah. OSTENSON: They see echoes of the world that they know. NADWORNY: He says these books don't always have happy endings, and they're all about consequences. OSTENSON: The hallmark of moving from childhood to adulthood is that you start to recognize that things are not black and white and that there's a lot of moral and ethical gray area out there. NADWORNY: Which makes dystopian fiction perfect for the developing adolescent brain, says Laurence Steinberg, a psychologist at Temple University. LAURENCE STEINBERG: It isn't so much rebellion, but it is questioning. NADWORNY: As the brain develops, so does executive function skills, understanding argument, logical reasoning and hypotheticals. That's coupled with this intense arousability (ph) - so many new emotions, stronger emotions than when they were younger. STEINBERG: When teenagers feel sad, one of the things that they often do is to put themselves in situations where they feel even sadder. NADWORNY: They listen to sad music. They watch mellow dramatic TV shows. And dystopian novels, they have all that and big emotional ideas like justice, fairness, loyalty and mortality. STEINBERG: The fact that it's fiction allows kids to flirt with those kinds of questions without really doing anything that might get them into trouble. NADWORNY: And I think teachers and parents can probably be grateful for that. Elissa Nadworny, NPR News, Holland, Mich.
(SOUNDBITE OF HARALD KINDSETH'S "KEFI") Transcript provided by NPR, Copyright NPR.